I take the trip from SEA -> SJC -> SEA often sometimes twice a month. Last week I took the trip from SEA to SJC and it took me 24 hours to get there. Why? Because I took the Amtrak Train with son for spring break to see his Grandma, Aunts, and Uncles. My little boy had so much fun he wants to take the ride every year. The Seattle Amtrak terminal is newly remodeled. 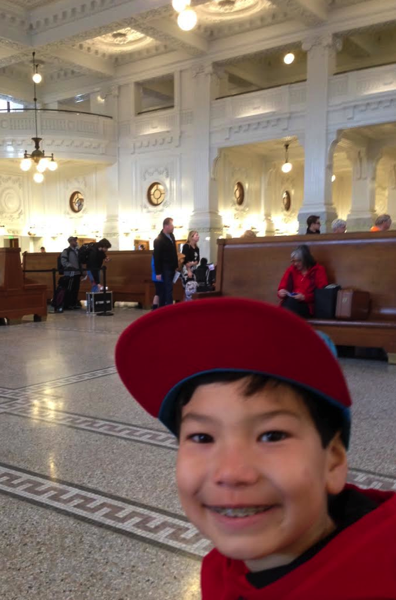 The Coast Starlight is a ride I have wanted to take for a while and I convinced my son, well didn’t convince him, gave him no choice that we were going to ride the train the SJC. This legendary train features bi-level Superliner coaches and sleeping cars, along with exclusive amenities. The Dining Car offers fresh cuisine served on real china and table linens. Coach passengers enjoy big, comfortable seats, plenty of legroom and new, larger pillows, plus available at-seat meal service. Sleeping car passengers can experience a full range of exclusive services and amenities on the Coast Starlight, including complimentary onboard internet access via AmtrakConnect and an exciting alternative meal service, both available in the Parlour Car. Each sleeping car passenger will receive complimentary meals (with the exception of alcohol) in the Dining Car or the Pacific Parlour Car and a special welcome gift. This "living room on rails" is the perfect place for sleeping car passengers to relax, celebrate or socialize. With an onboard theater and alternative dining venue, the Pacific Parlour Car will make your Coast Starlight experience unforgettable. I thought my son would like to hang out in the parlor car. But that’s where i had it wrong. He was happiest in the roomette sleeper room we had, watching videos on his iPad and looking out the window. Couldn’t resist wandering around and seeing where the 480V power systems were in the car.